In this tutorial, you configure a pipeline that continuously delivers your Alexa skill using the Alexa Skills Kit as the deployment provider in your deployment stage. The completed pipeline detects changes to your skill when you make a change to the source files in your source repository. The pipeline then uses the Alexa Skills Kit to deploy to the Alexa skill development stage. To create your custom skill as a Lambda function, see https://developer.amazon.com/docs/custom-skills/host-a-custom-skill-as-an-aws-lambda-function.html. You can also create a pipeline that uses Lambda source files and a CodeBuild project to deploy changes to Lambda for your skill. For example, to create a new skill and related Lambda function, you can create an AWS CodeStar project. See Create an Alexa Skill Project in AWS CodeStar. For that option, the pipeline includes a third build stage with an CodeBuild action and an action in the Deploy stage for AWS CloudFormation. A CodeCommit repository. You can use the AWS CodeCommit repository you created in Tutorial: Create a Simple Pipeline (CodeCommit Repository). An Amazon developer account. This is the account that owns your Alexa skills. You can create an account for free at Alexa Skills Kit. An Alexa skill. You can create a sample skill using the Get Custom Skill Sample Code tutorial. Install the ASK CLI and configure it using ask init with your AWS credentials. See https://developer.amazon.com/docs/smapi/quick-start-alexa-skills-kit-command-line-interface.html#install-initialize. In this section, you create a security profile to use with Login With Amazon (LWA). If you already have a profile, you can skip this step. Use the steps in https://developer.amazon.com/docs/smapi/ask-cli-command-reference.html#generate-lwa-tokens to create a Security Profile. After you create the profile, make a note of the Client ID and Client Secret. Make sure you enter the Allowed Return URLs as provided in the instructions. The URLs allow the ASK CLI command to redirect refresh token requests. Locate your skill by name and then copy the associated ID in the skillId field. (Optional) Create an interactionModel folder. Use this command to generate the interaction model file within the folder. For locale, this tutorial uses en-US as the locale in the filename. git commit -m "Added Alexa skill files"
Open the CodeCommit console, and choose your repository from the Repositories list. Choose Add file, and then choose Upload file. Choose Choose file, and then browse for your file. Commit the change by entering your user name and email address. Choose Commit changes. Repeat this step for each file you want to upload. CodePipeline uses a refresh token based on the client ID and secret in your Amazon developer account to authorize actions it performs on your behalf. In this section, you use the ASK CLI to create the token. You use these credentials when you use the Create Pipeline wizard. The sign-in browser page displays. Sign in with your Amazon developer account credentials. Return to the command line screen. The access token and referesh token are generated in the output. Copy the refresh token returned in the output. A source stage with a CodeCommit action where the source artifacts are the Alexa skill files that support your skill. 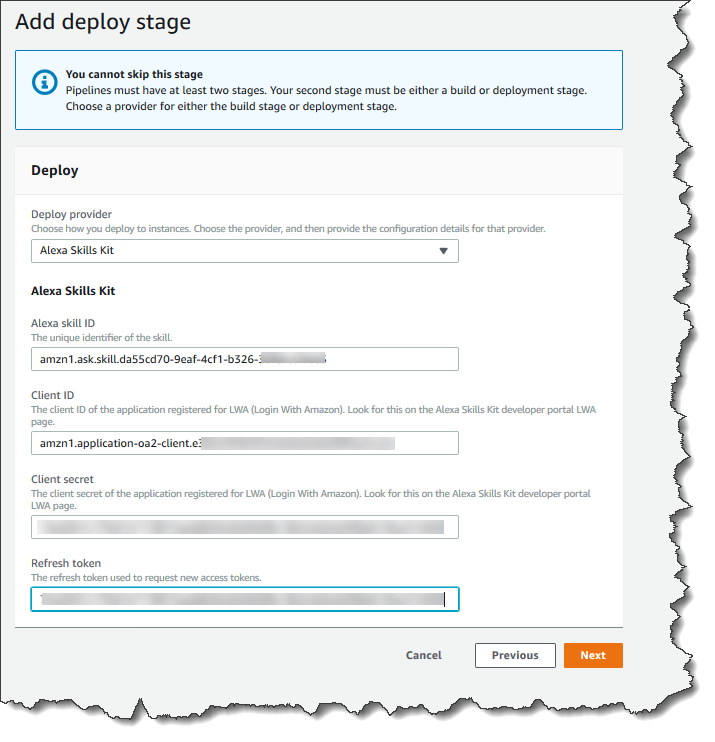 A deployment stage with an Alexa Skills Kit deploy action. In Step 1: Choose pipeline settings, in Pipeline name, enter MyAlexaPipeline. Choose New service role to allow CodePipeline to create a new service role in IAM. In Role name, the role and policy name both default to this format: AWSCodePipelineServiceRole-region-pipeline_name. For example, this is the service role created for this tutorial: AWSCodePipelineServiceRole-eu-west-2-MyAlexaPipeline. Depending on when your service role was created, you might need to update its permissions to support other AWS services. For information, see Add Permissions for Other AWS Services. After you select the repository name and branch, a message shows the Amazon CloudWatch Events rule to be created for this pipeline. In Step 3: Add build stage, choose Skip build stage, and then accept the warning message by choosing Skip again. In Deploy provider, choose Alexa Skills Kit. In Alexa skill ID, enter the skill ID assigned to your skill in the Alexa Skills Kit developer console. In Client ID, enter the ID of the application you registered. In Client secret, enter the secret you chose when you registered. In Refresh token, enter the token you generated in step 3. Make a change to your skill and then push the change to your repository. This triggers your pipeline to run. Verify that your skill is updated in the Alexa Skills Kit developer console.